In new episodes, airing February 17-21, Daniel and his friends learn to tackle the emotions that come with being a little kid in a big world. Arlington, VA, January 23, 2014 – This February, PBS KIDS will feature a special week of the top-rated DANIEL TIGER’S NEIGHBORHOOD, with the debut of five new episodes that focus on the big emotions that young children experience. In “Daniel’s Big Feelings Week,” which airs from February 17 to 21, Daniel Tiger and his friends will help children and families learn strategies for dealing with feelings of jealousy, disappointment, frustration and empathy. Episodes from “Daniel’s Big Feelings Week” will be available on DVD starting February 25, when the first DANIEL TIGER’S NEIGHBORHOOD DVDs, “Daniel’s Big Feelings” and “Life’s Little Lessons,” will be released wherever DVDs are sold. 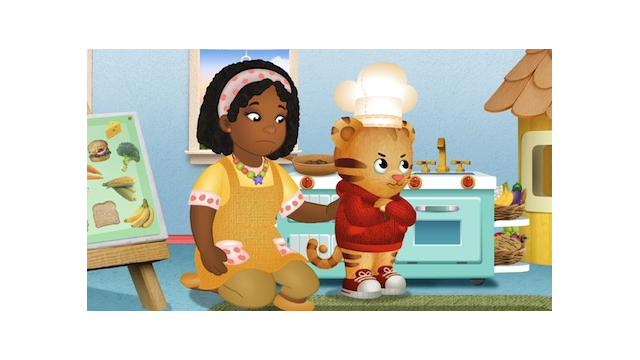 A new DANIEL TIGER’S NEIGHBORHOOD game, “Let’s Make Believe,” launches on pbskids.org/daniel in February. In this game, children make choices for Daniel’s make-believe play, finding encouragement for their own imaginative ideas and building creative thinking, visualizing and problem-solving skills. DANIEL TIGER’S NEIGHBORHOOD, which debuted on PBS KIDS in September 2012, is the first television series produced by The Fred Rogers Company since the iconic MISTER ROGERS’ NEIGHBORHOOD. Every episode of the well-loved show features two endearing stories starring four-year-old Daniel Tiger and his best friends, who invite young viewers to come with them on fun adventures as they explore the colorful Neighborhood of Make-Believe. Series creator Angela C. Santomero (SUPER WHY, Blue’s Clues), from lead production partner Out of the Blue Enterprises, is co-executive producer of the show, along with Kevin Morrison of The Fred Rogers Company and Vince Commisso of the award-winning animation studio 9 Story Entertainment. Episode air dates and descriptions follow. High-resolution images from “Daniel’s Big Feelings Week” are available on PBS PressRoom; screeners and clips are available upon request. “Duckling Goes Home”: Today at school, the children find out that Ducky has grown too big to be their classroom pet and it’s time to take him back to the farm. This news is very upsetting, especially to Daniel and Miss Elaina. The children cope with their sadness in different ways and soon they feel a little bit better. “Daniel Feels Left Out”: On their way home from the Neighborhood grocery store, Dad and Daniel stop by the Treehouse to say “hello.” O the Owl and Katerina Kittycat have been playing together all day, and are even going to have dinner together. When it is time to go home with Dad, Daniel feels left out and sad. Back at home, Mom and Dad Tiger help Daniel with his sad feelings and he soon starts to feel better. Strategy: It’s ok to feel sad sometimes; little by little you'll feel better. “Daniel Gets Frustrated”: Daniel is staying at home with Mom Tiger today. He really wants to play with Prince Wednesday, but the prince is visiting his cousin Chrissie. He asks Mom if they can go to Music Man Stan’s shop, but they can't because it is closed. Daniel gets really frustrated when it seems that he’s unable to do anything he wants to do. With some guidance from Mom, Daniel learns how to work through his frustration. “Frustration at School”: Daniel and his friends are playing “restaurant” at school and Daniel feels frustrated when he can’t find the toy he is looking for. Teacher Harriet helps him realize that the right thing to do is to take a step back and ask for help. Strategy: When you’re frustrated, take a step back and ask for help. “Daniel Is Jealous”: Daniel and Katerina are playing “airplane” with Grandpere. Daniel thinks Katerina is getting too much attention from Grandpere and starts to feel jealous. Daniel explains his feelings and is reassured that he is Grandpere’s one and only Daniel. “Jealousy at the Treehouse”: Daniel and Katerina are at O the Owl’s house today, playing with his new science kit. Daniel and Katerina feel jealous of O because they want science tools just like his. After talking about their feelings, the children realize how they can all enjoy O’s special science kit. Strategy: When you feel jealous, talk about it. “Someone Else’s Feelings”: Daniel and O the Owl are pretending to be handymen, using their toy tools to make “repairs” to Daniel’s playhouse. Daniel is having lots of fun hammering loudly, but it’s upsetting O, who would rather do something quieter. Daniel loves hammering so much that it’s hard for him to see why it upsets O. Mom helps Daniel be empathetic and think about how O is feeling: Daniel remembers a time when he was upset because Miss Elaina was being way too loud for him. He doesn’t want O to feel this way, and he realizes that they can both have fun as quiet handymen! “Empathy at School”: Chrissie and Daniel are playing together at school today, but when Chrissie loses her special bracelet, she doesn’t feel like playing anymore. Daniel has trouble understanding why, until Teacher Harriet shows him how to be empathetic and think about how Chrissie may be feeling. Daniel remembers just how worried he was when he thought he had lost Tigey and decides to stop playing and help find the bracelet. Strategy: Think about how someone else is feeling. “Line Leader Daniel”: The children are getting new classroom jobs at school. Daniel really wants to be line leader! When he doesn’t get the job he wants, Daniel is disappointed. Soon he learns that all of the jobs are necessary to keep the classroom running smoothly. “Neighborhood Jobs”: Daniel and Mom Tiger are visiting the library today. Unfortunately, X the Owl isn't feeling very well and needs to go to the doctor. Daniel learns the importance of all the Neighborhood jobs when he and Mom Tiger fill in as librarian for X so he can see Dr. Anna. Strategy: Everyone’s job is important; we all help in different ways. The company was founded by Fred Rogers in 1971 as the non-profit producer of Mister Rogers’ Neighborhood for PBS. In the years that followed, it not only created hundreds of episodes of this much-loved program, but also extended Fred’s values and approach to other efforts in promoting children’s social, emotional and behavioral health and supporting parents, caregivers, teachers and other professionals in their work with children. The Fred Rogers Company continues to build on Fred’s legacy in innovative ways through a wide variety of media, and engaging new generations of children and families with his timeless wisdom. For more information, visit us at www.fredrogers.org.